Mardis Gras Swig N' Swing! 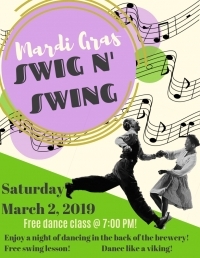 Get the party going right and celebrate Mardi Gras with a Swig N' Swing at Mad Swede Brewing! Free dance lessons starting at 7:00 PM! No partner needed! No experience necessary! Just bring yourself and your dancing shoes and be ready to get down! Swing on by and enjoy a cold beer and maybe even a couple dances! After the free dance lessons, we'll be spinning tunes until our feet fall off!